It’s almost time to break out your black ‘n’ orange, folks! After all, there are just two days until Halloween, aka the scariest holiday of the entire year! And you know what that means. It’s time to pin down the absolute perfect costume, of course! If you’re still struggling to find a fa-BOO-lous guise for your fright night festivities, then you’re in luck! We’ve selected the hottest celebrity-inspired costumes—for guys and gals—for you to choose from, with specs and sunnies that’ll take them to next level! So take your pick—you’re sure to look spook-tacular in any of these get-ups! Television’s most popular male stars were our inspiration for this year’s must-have costumes for dudes! Pay tribute to meth-making extraordinaire Walter White from “Breaking Bad” by sporting his classic neon yellow “cook coat” with his old-school metal specs like those from Apollo Sport! 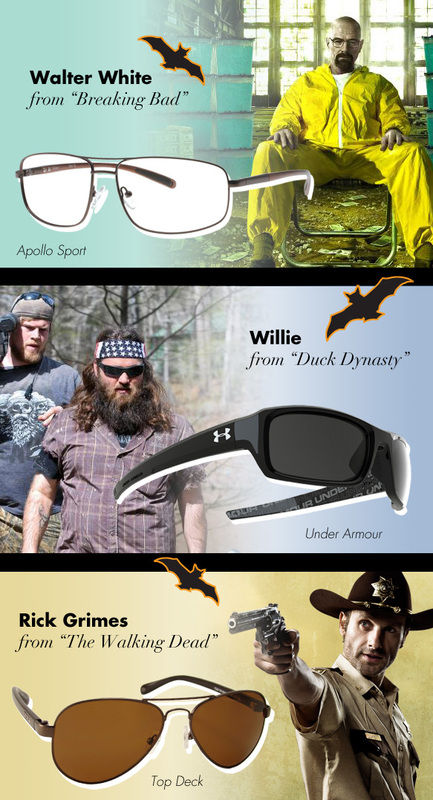 Get your duck hunt on by dressing up as Willie from “Duck Dynasty”—a worn plaid shirt, American flag bandana, faux beard and sporty wraparound sunnies from Under Armour will do the trick! Or get prepped to fight off the dead by playing the role of former cop turned zombie hunter Rick Grimes of “The Walking Dead.” A traditional sheriff’s outfit, topped off with aviator shades from Top Deck (and perhaps some blood and guts) will instantly make you look the part! To boot, we’re obsessed with the idea of chicks dressing up as music’s craziest female pop legends! Throw on a bright blue wig, cupcake- or candy-adorned dress and dreamy round shades with vibrant-hued lenses from MYKITA, and you’ll instantly be a Katy Perry lookalike! Transform into Lady Gaga’s doppelganger with a glitzy geometric silver dress, a platinum blonde wig and sleek metallic sunnies from L’Wren Scott. Or “twerk” the night away in Miley Cyrus’ infamous bear leotard, with your hair pulled into two buns and cherry red cat-eye Face à Face glasses for an added dose of cool!